Can anyone tell what the 4 goddesses are talking about in that scene? EDIT: With the exception of Neptune herself, I reckon the goddesses all have better character designs in human form. Last edited by Nerroth; 2010-07-26 at 17:55. Seriously can't find anything bad about this PV. I just need to post this quote. The NIS and Gust girls are being made available as DLC additions to your in-game party. Last edited by Nerroth; 2010-09-13 at 13:19. There are some nice Neptune vids floating around YouTube: these three show what Noire, Vert and Blanc are like in a fight (in both pre- and post-henshin forms). There are two brand new DLC characters in the works; one of which is voiced by nao, who sings the game's OP song! 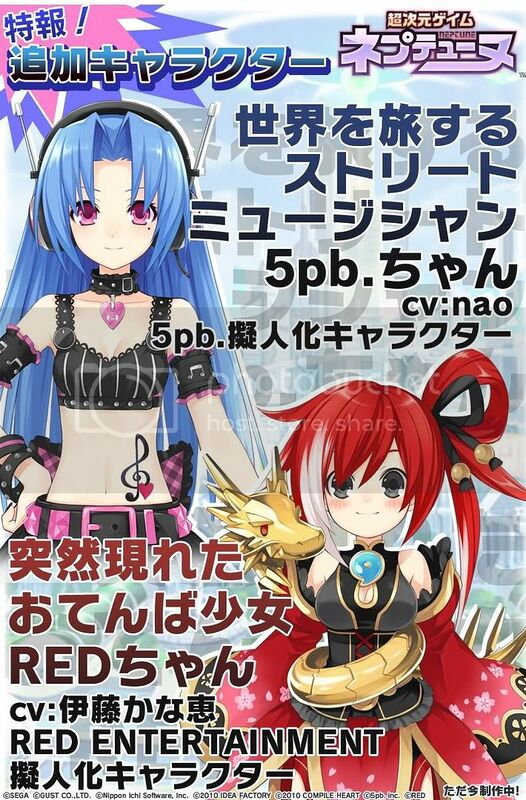 Last edited by Nerroth; 2010-10-21 at 23:27.
the DLC characters are personification of 5pb and RED entertainment. (IIRC, they're the record label for CJG Neptune's OP and ED). Yep; there's more info on the two in the latest blog update. And we have a a go! but the name change... ^^; Neptunia... lol. The name change is nothing you should worry about. The character is still called Neptune, they just changed the name of the game. Well I've always been quite interested this game before the localization announcement, but now that it actually happened... I don't really feel all too excited about it anymore. I'll probably still end up buying it for the interesting premise and cute characters (and to support NISA of course), but I suppose I just came to the realization that I'm not the biggest fan of Compile Heart games. Oh well, I'll give them another shot. NISA's year of 2011 is shaping up to be really interesting with Ar Tonelico 3, Disgaea 4, Prinny 2, and now this as well. Even though I don't have a console, I must say that there is one thing that is definitely worth getting for this game : the VISUAL ART BOOK. Somebody was kind enough to sell a copy to me. No scans for you guys yet though, don't wanna spoil a treasure like that. For some reason, If looks incredibly tsundere. Does this girl remind anyone of Asahina Mikuru from Haruhi? Dojikko + Cuteness + Boobies? NOW WHAT SHE NEEDS IS CAT EARS AND A "NYAAAA~". If you haven't bled to death, the rest can be found here. Last edited by SaintessHeart; 2010-10-29 at 14:38. ^ Lucky you. The artbook were only a preorder bonus, right? They always tend to package art books and soundtracks with their localized games, though their never actually on the same level of quality as the Japanese equivalents. I'm sure Neptunia has a good chance of getting an artbook with the game here; their previous U.S. releases in Trinity Universe and Atelier Rorona got one after all. and another question. Does NISA tend to keep the Japanese voice in their games? Thanks.